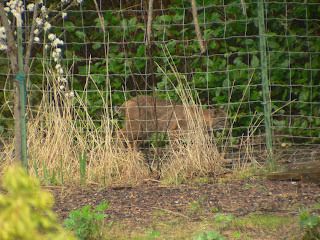 A bobcat came into the yard Saturday, in the middle of a gray and drizzly afternoon. I was on the phone with my mom, when Roger said, "Hey there's some kind of animal in the yard." I looked out, and at first thought I was seeing the back of a good-sized dog. Roger said, "It's a bobcat!" 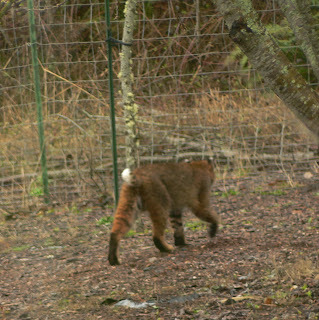 I yelled into the phone, "Bobcat-- gotta go," hung up, and picked up the camera. Roger picked up the binoculars. We watched. It moved confidently, though it did not stop to sniff a single thing. Only a scant 42 seconds passed from the time we first saw it to when it was completely out of sight. It made me think of a line from Joni Mitchell's song Down to You "...pleasure moves on too early..."
We've had bobcats in and around the yard several times over the past three years. This one looked to be larger than the others. Roger measured the fence to try to determine how tall this one was-- nearly 28 inches. 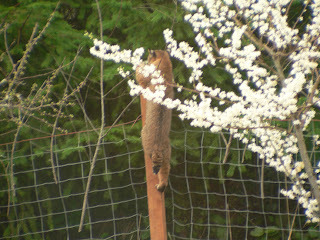 The other one we could measure by the fence was only 20 inches. 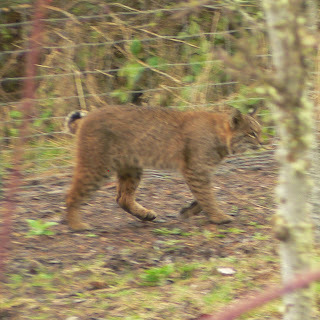 This bobcat surprised us by leaping with incredible agility to the top of the wooden fence post to exit. 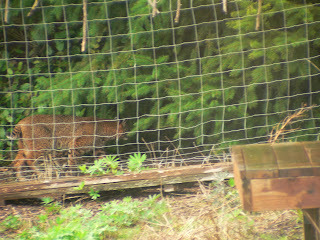 The other cats we saw had climbed through the wire openings in the field-fencing. We surmised that this cat was simply too large to fit through as the others had. Once it leapt down to the other side, it sauntered just along the fence before veering off quietly into the trees. Then it was gone, like all ephemeral pleasures. All that was left was our wildly beating hearts and gratitude that we have been so incredibly lucky over the years to have seen these furtive and beautiful little predators. In the other world, the one where Bush is still the boy-President, we've been rather pleased by the turn of events. Actually we feel as giddy as we did during the days of Watergate. Oh please, we beseech the nameless and godless power of the universe, take down this boy-President and shame him in the eyes of the world. 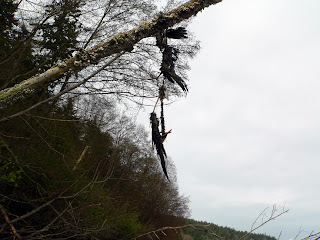 Let him hang like the eagles have had their way with him, until all that's left is his sorrow. 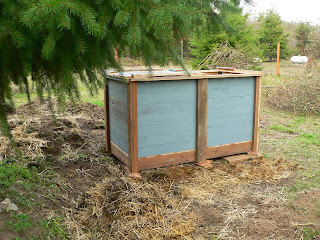 this is our old way of composting, sometimes called informal. just make a pile of everything that rots, (leave out those meats scraps though, for compost quality, and eggshells too, the raccoons can sniff them out). it doesn't look like much of a pile because it has shrunk considerably. some things take quite a while to break down into compost: corn stalks, straw, grape vines, small branches. 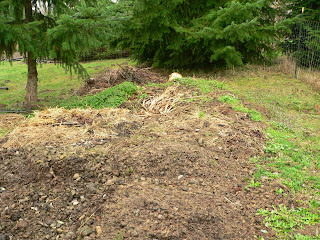 we have not yet "harvested" any compost from this pile. i have dug into it to check and there is some good compost mixed in with the aforementioned slow rotting ingredients. there is horse manure in the foreground but the day laborer (that would be moi) hasn't yet mixed it into the other stuff. the whole thing is a bit unsightly. ok. tech specs. each bin will hold close to a cubic yard. three feet be three feet by three feet. the top covers slide off to the front and halfway back to the rear. the front boards lift out to remove the contents. like the nice blue hue? those are the painted and caulked cedar trim we removed from our house when we replaced the siding with shingles. i scraped off the caulk. here are some plans. 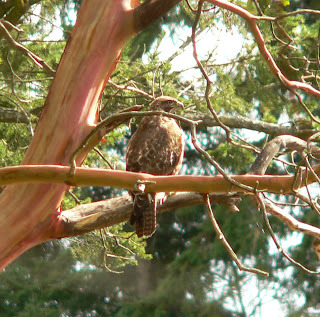 Ever since I received the dreaded diagnosis last week of osteoporosis in my spine, I have been dreaming of hawks. 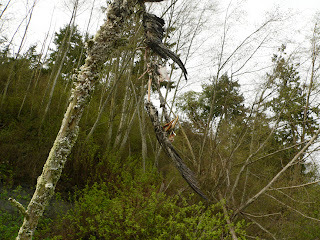 They showed up and began devouring little birds and littering my dreams with the broken bodies. I often have vivid dreams, and these were no exception. Only I let myself interpret them through the lens of my aging body. Perhaps it isn't exactly fair to lay blame on age. Really, it's my size that made me vulnerable. I'm small-boned, and probably never reached maximum density. Now my bones are simply not rebuilding as quickly as they are breaking down. They seem to be turning to dust while I'm still using them. I am weighing my options. 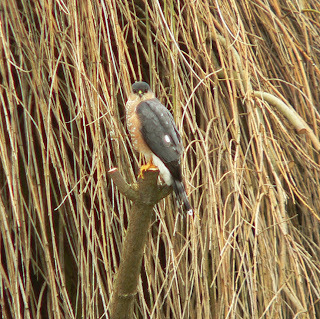 The hawks have paid me their visit. They have looked at me with their red eyes, their yellow eyes. I have stared unflinchingly back. Perhaps there is a truce in the offing, and I will be the little bird that flies faster and gets away. It has been grand to be away, reading blogs, but not feeling compelled to write something here. 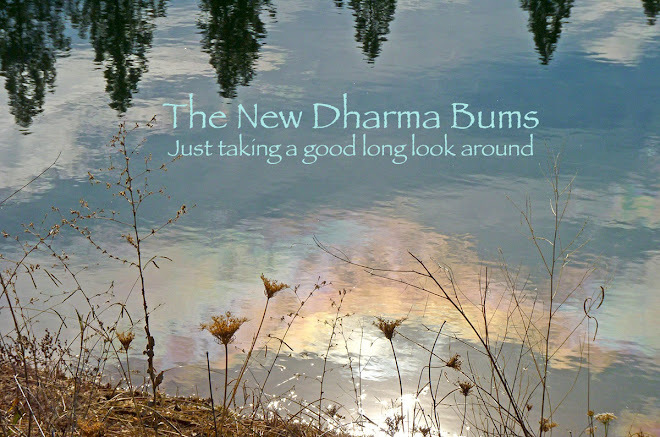 We love this new-found freedom. We are in the waning days of winter. Buds and blossoms are everywhere. Roger is building a compost bin. I've just finished reading Thom Hartmann's Screwed: The Undeclared War Against the Midddle Class. A thoughtful and well-researched look at the dismantling of the middle class since the Reagan years. If you really want to go extra crazy, definitely pick this book up. You'll finish wanting to storm Washington DC with your pitchforks and torches demanding a restoration of our constitutional right to happiness and a general welfare. We'll be back again soon. How are y'all?